The British war games appear strange because Jordan lacks the operational capacity to aid the UK military in any situation that may arise in Ukraine or Eastern Europe, says Danny Makki from the Syrian Youth in Britain movement. 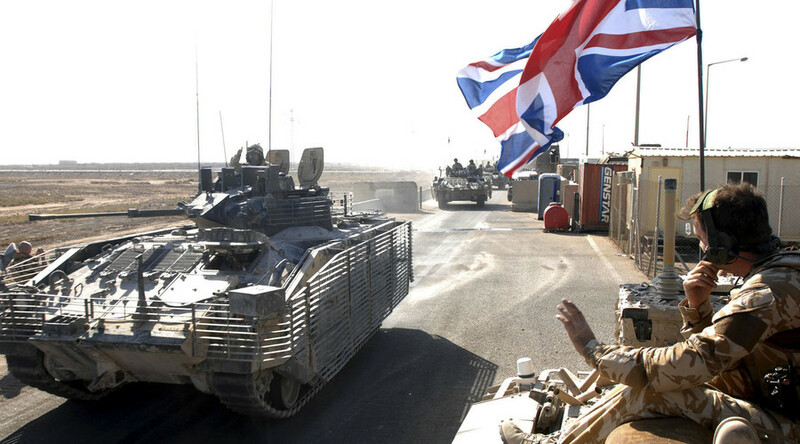 The UK is preparing to send hundreds of troops to Jordan for large-scale war games. The Telegraph newspaper reported the exercises could be a rehearsal for sending British troops to Eastern Europe in the event of a Russian confrontation with NATO. RT: As the Telegraph suggests, do you think it's true that the UK's exercises are likely to be a preparation for joining the US in Ukraine if needed rather than countering ISIS? Danny Makki: It is very interesting because the fact that these war games, which are incidentally the largest war games since the US-UK invasion of Iraq, have been held in Jordan of all countries. The main army source stated that it was not an anti-ISIS operation, and that it would perhaps involve Eastern Ukraine and Eastern Europe in general. It is more likely that it is against potential Russian threats either in Syria or Eastern Europe. But the location of Jordan is quite strange: it is a very distant country from Eastern Europe, and the terrain and the geography of Jordan is completely different to that of Eastern Europe, and especially Ukraine. So, the location of the country actually presents a different picture. This could perhaps or potentially be an operation, potentially against Russian troops in Syria or in the Middle East, as opposed to Eastern Europe. And the fact 300 military vehicles would be sent to Jordan suggests that this is regarding the Middle East more than Eastern Europe, in my particular opinion. RT: So, do you link the choice of the location with the possibility of these troops being used in the Middle East? What’s the connection there? DM: It is strange because what kind of operational capacity would Jordan have to aid British war games within Jordan when the aim as stated is Ukraine or Eastern Europe. It doesn’t make sense. There is no inextricably intertwined link between the two. So, it is probably more foreseeable to argue that this may perhaps be either an operation which may come out of the reaction from events in Syria or the region, or it may be a wider, bigger strategy of the UK to integrate Middle Eastern partners into future anti-Russian operations or anti-Russian war games. The element of the fact is that Russia is the main aim or target, we could argue, of these operations and war games because it potentially views Russia from a second Cold War perspective, arguably part two of the Cold War, where in the future, potentially, there may be a time where you may have a need for a British division to be sent to an area of the world to support either US intervention or interference in that manner. And seeing that the US has been critical or skeptical of the ability for the British armed forces to send troops and divisions to different areas of combat this is definitely a message from the MoD and the Brits that they are actually working very hard to maintain the operational capacity of their troops and divisions. And that if a time [comes when] British troops may be needed in these areas, the Brits are more than happy to send troops and have the operational capacity to do so, be it in Jordan or Eastern Europe or any other area of the world. RT: The drills are the largest of their kind in 15 years and clearly don't come cheap. So why is the UK spending the money in the face of austerity and cutbacks? DM: This is very significant considering the fact that there is austerity in times when an economic hardship is on many of the people in the UK and Europe in general. But we can’t forget the fact that the UK has to have a global presence in terms of its armed forces. There has been much skepticism and criticism of these defense cuts which have occurred. In my opinion, the UK armed forces have actually taken this as a message and a sign to allies and potential enemies that the UK is ready to enter war games or other conflicts in terms of operational capacity. The strange thing is for an official to state that this is to deter the terrorist threat against the UK, when another official is stating that this isn’t to do with the anti-ISIS coalition. This is quite blurred in a sense that if these war games were to actually fight ISIS in Syria or Iraq, this would actually have to come through an Arab coalition considering the fact that Jordan is actually a part of this coalition as well. And the likelihood of the UK actually deploying potential troops to Ukraine or Eastern Europe is very unlikely in this day and age. It reaffirms the point that I initially made: this is more likely to have in a Middle Eastern presence and show preparedness by the British armed forces to react to any quick events which may develop in the Middle East. This could be a potential Arab coalition against ISIS in Syria or against President Assad, or the UK to actually support operations against either in any potential flare-up of relations or escalation on the ground in Syria or Iraq for that matter.